Stories | What's So Funny! A walk in the woods with nothing to say delves into trees, poetry, WWI, world culinary and etymological history, and a fart joke. This time Rich explores an ongoing gig, working as a frontman for a fortune telling booth at the Maryland Renaissance Festival. Looking at crowd work, salesmanship, and the dilemma between the art and the mission. So last week, I went to perform my comedy/juggling act a local juvenile detention center. At first, I thought it would be immigrant teens separated from their parents at the border. The revolving door quality of the facility makes it difficult to predict who will be in at any given time. All that could be counted on is the age: 14-17 year olds. Not my typical demographic, but I jumped in with both feet anyway, to “give back” to some who may not normally be exposed to the type of entertainment that I do. Hat tip to Alain Nu, the Man Who Knows, for connecting me to the fledgling program. 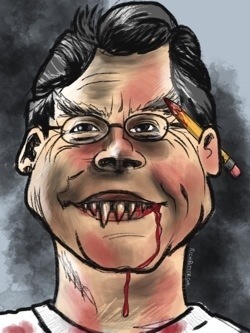 It is very strange to me to say this, but thank you Stephen King. I mean this sincerely although you have hurt me personally and professionally, and countless other people with your writing. You probably didn’t realize that would be the effect of your work; you probably didn’t mean to give a complex to children too young to be watching your movie on cable TV about a homicidal interdimensional being that takes on the guise of a whiteface clown. But you did. You probably didn’t mean to shift (mostly American) attitudes against an ancient profession (older than writing, mind you), but you did. Well said; succinct. Like a man who has practiced the craft, as well as the Art of good writing. You have inspired me to “get up and work.” I’ve been slacky about getting it written: “I’m not in the mood,” or “I don’t know how to proceed.” You have inspired me to push through my self-doubt and write every day. So thank you. By the way, my first novel is about a medieval clown. That’s irrelevant, but I thought it might be interesting to you. . I’m sure it will be garbage. I realize that when learning to write, the first million words are just practice. Enter the imposing figure of the bespectacled Featherweight the Dancing Horror/Fantasy Writer. Featherweight really only appears to be human; “That” is actually an interdimensional creature that feasts on the flesh of outcast children. After a series of bloodbaths, the children of the town beat him back to Dimension X by hurling at him a barrage of split infinitives and broken metaphors. Featherweight returns in the late 1990s, having gained his strength back over the ensuing 30 or so years. Like a bad simile, he always turns up –– largely rejuvenated by the inexplicable fame of The New Kids on the Block. Unfortunately for him, but fortunate for Mankind, he is immediately squashed once he reads the level to which writing has sinked in the then nascent World Wide Web. Forevermore thereafter, the world is safe from homicidal interdimensional horror/fantasy writers. Mr. King? I look forward to being seen as a professional in your eyes. Cheesecake Factory vegetarians: Make sure the manager specifies there is no armadillo meat in your stuffed mushrooms. This is a response to my article on “Cheesecake Factory, Why do you Hate Vegetarians” a month ago. Their response by Customer Relations was timely; my posting about it is not. So kudos to Customer Relations! The end of the story I find more disappointing. Basically, they put the onus of checking each and every dish on their vegetarian customer. Their suppliers will change ingredients in their products without notice, so they can’t print permanent menus. One ingredient changes; they’d have to reprint all their menus. Perhaps I’m coming across like the whiny, spindly high-maintenance grass-eater. But consider were you to be traveling in a foreign country where everyone eats dog (insert your own personal abhorrent foodstuff as for all I know, some of you would enjoy eating Petey). And then you go into a restaurant which boasts it caters to non-dog eating foreigners. The menu has listings of “Dog meat… Dog meat … cheese sandwich … dog meat…” You order the cheese sandwich. Halfway through the sandwich, you discover a piece of medium-rare Dalmatian snout. That’s kinda what it’s like being a vegetarian: I live in a foreign land where eating meat is the custom. Someone tried to accommodate and accidentally fed me [dog]. I let them know; they told me I should be more careful. Again, Cheesecake Factory’s head office was responsive enough to call me directly within 48 hours of my suggestion. They did give me a list of foods on their menu that are (or can be special ordered to be) vegetarian-friendly. However, the bottom line? They’re not going to change anything. You can not trust their menu if you are a vegetarian, and in my case, the new waiter, upon hearing my wife say we are both vegetarians, made no mention of the corpse-juice that would be on my plate. Apparently I should have known to distrust not only the menu, but also the waiter. I give the responsiveness of customer service an A. The result? I’ll be generous and say C-minus. They did send me a gift card. I’ll probably go back since hey; free food. I’ll just have to be extra careful to ask specifically of a manager whether the fettuccine contains braised armadillo chitterlings. Welcome to the gateway site of a number of my interests. I am just now figuring out WordPress, so this page should be taking shape over the next couple of months. www.RichPotter.NET – comedy juggler has performed since 1982 in circuses, festivals, and colleges. His family-friendly Bert the Nerd Thrill Show delights audiences young and old all over the world. To see his full 365 paintings, it’s currently easier to view at Facebook. Blog postings about the first two months, which will soon be migrating here. He is on a neverending quest to find out who “borrowed” the painting entitled “2AM,” right, from his last art show.